French elegiac poet; born in the second half of the twelfth century (Zunz ["Literaturgesch." p. 470] says that he flourished about 1200-10); brother-in-law of Joseph b. Nathan of Etampes, and great-uncle of the author of "Joseph le Zélateur." The latter reports in that work (No. 24) a discussion which Joseph had with an ecclesiastic. "A monk asked R. Joseph of Chartres why God had manifested Himself in a bush rather than in a tree. Joseph answered: 'Because it is impossible to make an image [crucifix] thereof.'" Joseph was a disciple of R. Tam and of Rashbam. He is cited in the "Semag" of Moses of Coucy (Prohibition 113) in connection with the ordinance forbidding the descendants of Ammon and of Moab to enter the Jewish community. He composed an elegy commencing with the words , on the massacre of the Jews of York, England, in 1191. 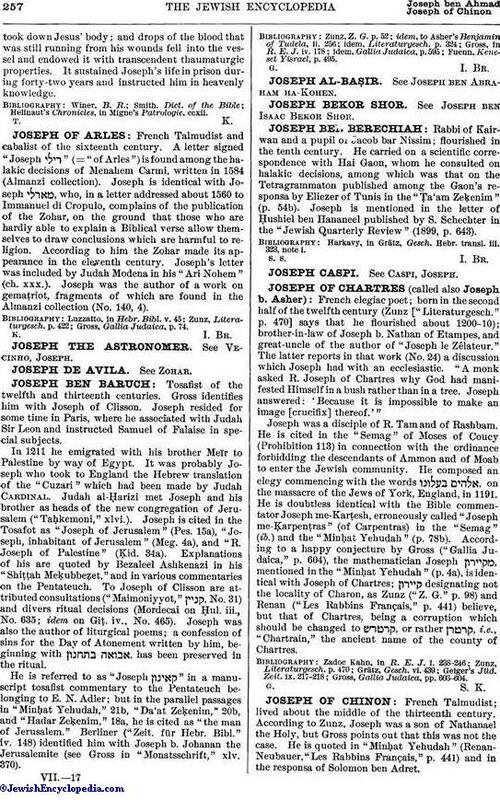 He is doubtless identical with the Bible commentator Joseph me-Karṭesh, erroneously called "Joseph me-Ḳarpenṭras" (of Carpentras) in the "Semag" (ib.) and the "Minḥat Yehudah" (p. 78b). According to a happy conjecture by Gross ("Gallia Judaica," p. 604), the mathematician Joseph , mentioned in the "Minḥat Yehudah" (p. 4a), is identical with Joseph of Chartres; designating not the locality of Charon, as Zunz ("Z. G." p. 98) and Renan ("Les Rabbins Français," p. 441) believe, but that of Chartres, being a corruption which should be changed to , or rather , i.e., "Chartrain," the ancient name of the county of Chartres. Gross, Gallia Judaica, pp. 603-604.